I got some of the pieces of my Spider Web quilt up on the design wall. Wow I am pleased with it. 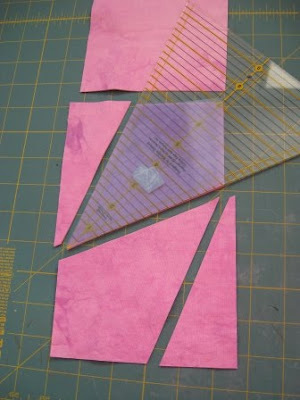 I am using my five hand dyed pink fabrics, they are Kona cotton and feel oh so nice. I dyed the pinks last spring. In this photo I still need to reach the top bit. This is not even one quarter of the quilt. I have planned bigger now. I got one block done. Oh no I have a lot of fussy piecing to do. I am taking one block at a time to the machine to sew and I am needing to use many leaders as most start with a point and my machine would eat it other wise. I may need a another project for leaders. My block is to measure 12 1/2" at this point, close on the first one. My drawing on paper I did, started as a finished 12" square block. 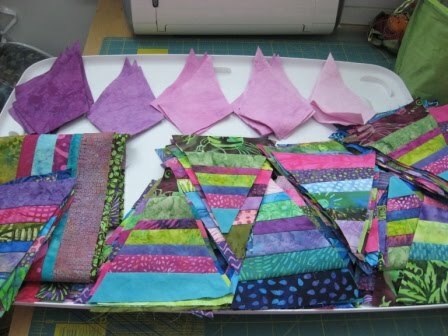 My strip pieced units are 6 1/2" (unfinished size) from point to the bottom row. I am fuzzy and do not want to lose my points. The blocks are going to take weeks to piece together. I thought I would make a large lap quilt but now I have decided to go for 96" square. That is 8 by 8 blocks, for a total of 64 blocks. Lots of cutting has gotten done. I may need a little more to get my 64 blocks. Here are some cutting demo photos. 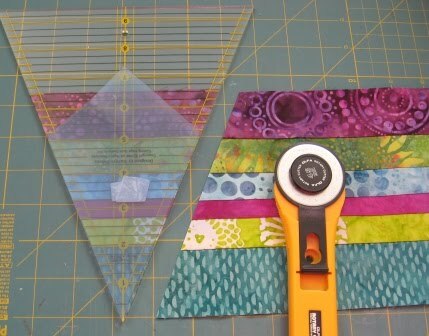 I first cut a strip 5 1/4" then cut using my star point template on my 22.5 degree ruler. The bottom of the template is lined up to the square corner of the fabric. 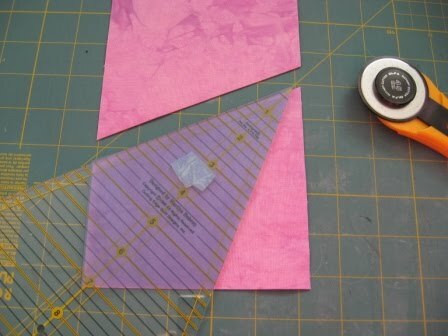 I then cut the next one, first cutting the strip at right angle 3 inches from the angle. The side of this template was 3" for the angled side. I know I am not saying this just right but maybe you will get what I say if you did want to try this block and cut it like I did. Here I cut the strips that are 6 1/2" wide. I had a couple that were a bit wider and I trimmed them down for easier cutting.The next piece will be cut with the teal on the bottom. 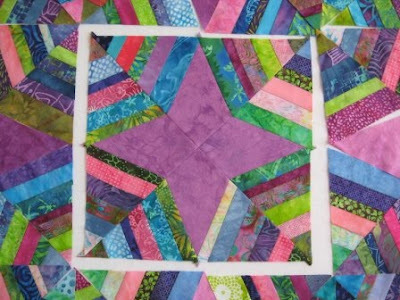 I must tell you I have found out the web quilt my mom did many years ago was not the same angle as this one. 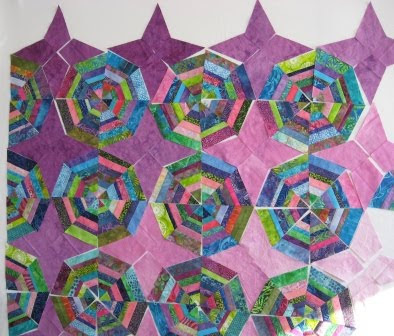 Her quilt used hexagons not the eight sides mine has. I love all your comments Thank You all. Please let me know if you have questions. 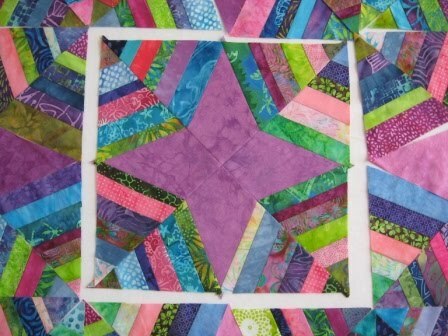 Your quilt is going to be gorgeous! I love those colors. 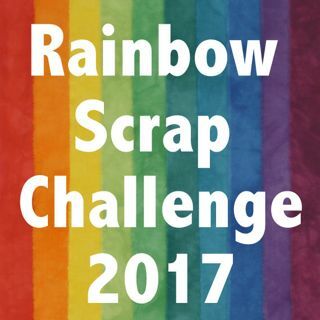 Gosh that is a LOT of effort...very inspiring and it looks like its going to be very rewarding too.